Planning a family vacation in Minnesota? We are easy to find. 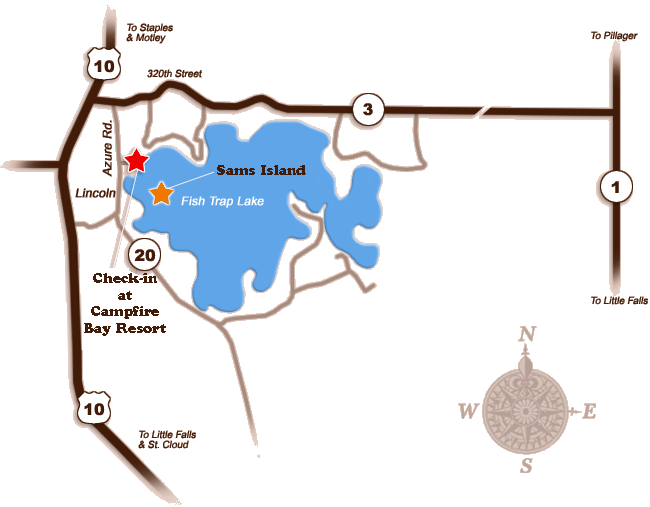 Sams Island Cabin is located just off of U.S. Hwy. 10 on County Road 20. Five miles past Cushing, MN turn right onto Morrison County Road 20 / Azure Road, there’s a business named Hilltop Sports on the corner. Go four miles north on County Road 20 / Azure Road and Campfire Bay Resort is on the right hand side. OR Continue on Hwy 10 a couple of miles past County Road 20 and turn right on County Road 3 at the Hwy.10/County Road 3 junction. (There is a BP station and a marine dealer, Staples Sports, on this corner). Follow County Road 3 to the first intersection and turn right on County Road 20. Campfire Bay Resort driveway is about 1/4 mile down the road on the left hand side. In short, Hwy 10, County Road 20 and County Road 3 form a loop, so any way you go is fine! You’ll check in at Campfire Bay Resort as that is where we, the island owners, live and work, and then you will be transported to Sams Island Cabin.